This is an update of a post that was first written by Sue Waters in 2013. Whether you’re blogging, using social media, producing videos, or publishing any digital creations, the topic of student privacy must always be considered. Information that helps someone identify a student should always be shared with care and appropriate permission must be sought. Many educators and schools wonder whether they should be sharing photos of students online. This post gives you some tips on sharing students’ images and other identifying information. Scroll down for a summary poster. 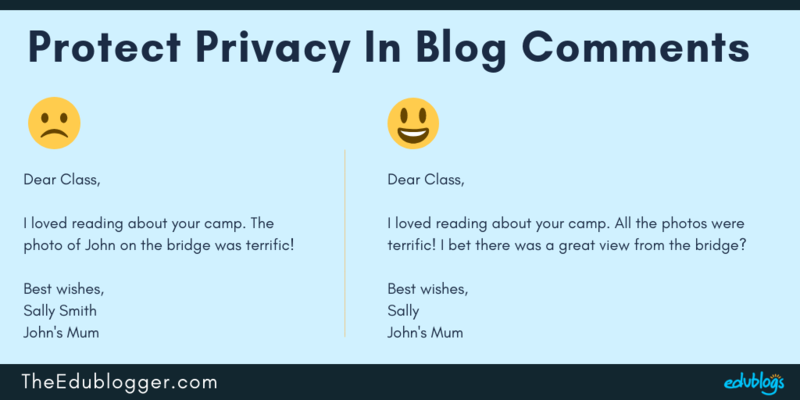 Even though 99.99% of visitors to your class blog will be well-meaning parents, students, community members, or interested visitors from around the world, the unfortunate reality is that those with bad intentions can also visit public sites. 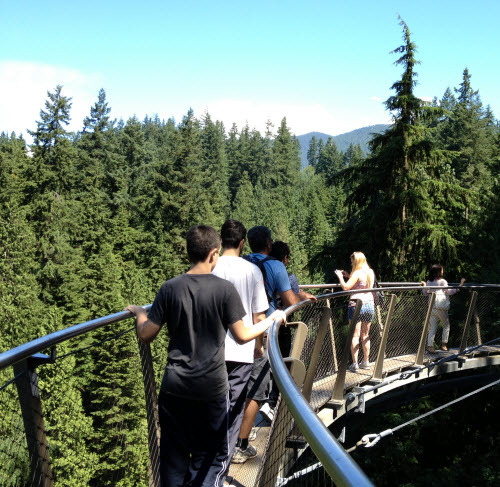 Some educators decide not to use student photographs on their blogs to avoid facing problems with parents, caregivers, or administrators who have concerns about cyber-predators. There are also cases where the personal background of a student might mean they need more privacy and anonymity than others. Furthermore, some people are selective about their digital footprints and try to limit their information and photos being widely shared. It can be fantastic to celebrate student achievements and showcase their learning. Photos can help build connections with other students and classes around the world. Many families also love seeing what their child is up to during the school day. Weighing up pros and cons is something for schools to evaluate while giving students and families individual choices. 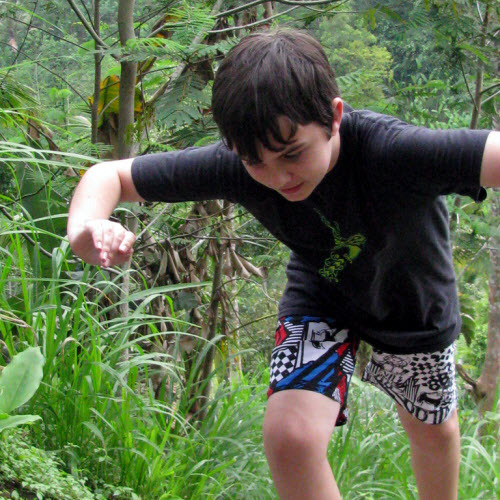 Whether or not you choose to use student photographs, there are strategies that should be considered to minimize any risk. You can make your blog private, or set it so it’s not indexed by search engines like Google but there are still things to keep in mind whenever any information is shared online. Find out your school, district, or Education Department guidelines for sharing student photos online — make sure you follow these guidelines. Find out if there are forms caregivers and students need to sign to consent to use of student photos online — make sure you have all forms signed by parents or caregivers. Respect the wishes of caregivers and students while understanding consent to use photos can be withdrawn at any time. If you are asked to remove any student information, act quickly. You can contact us if you don’t know how to remove images etc. from your blog. 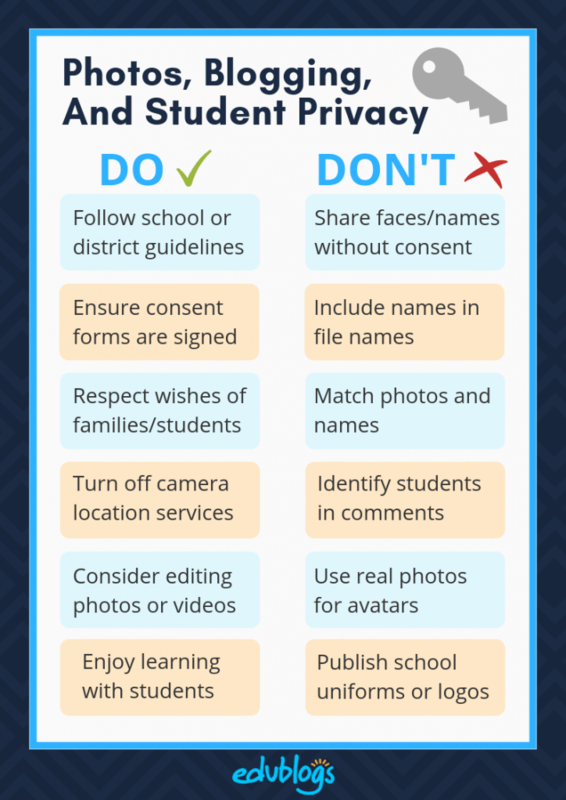 Remember, it isn’t possible to stop parents, students, and caregivers from downloading photos and sharing them on their social networks, even if you are using a private blog. If you don’t want a photo shared with others or shared on social media then don’t upload the photo. How easy it is to share an image! We suggest you consider using the following approach in regards to photos of students. Avoid the use of any photos that can identify individual students. A safe compromise is to only use photos taken from behind students. Remember, school uniforms and logos in images can quickly identify your school. Don’t use student photos for their avatars. There are many free online tools where students can create a cartoon representation of themselves (find some here in the Teacher Challenge). Or the students can even draw their own avatar and take a photo of it. 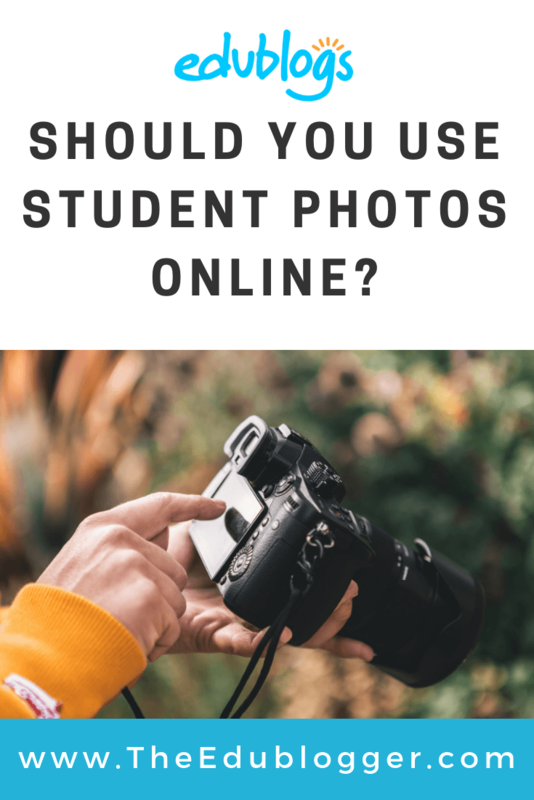 If you do use photos of students, don’t refer to the student by name (even their first name) in the caption under the photo or in the post. Don’t use student name/s in the file name of the photo. You might not realize this information is visible but if someone inspects or saves the file, the name is available for anyone to see. Turn off location services when taking photos on your mobile device. Location services can attach location data to pictures you take. Find out how to turn off location services on your iPhone/iPad or Android device. This photo has been taken from behind. Students can’t be recognized and the photo doesn’t refer to any individual student. 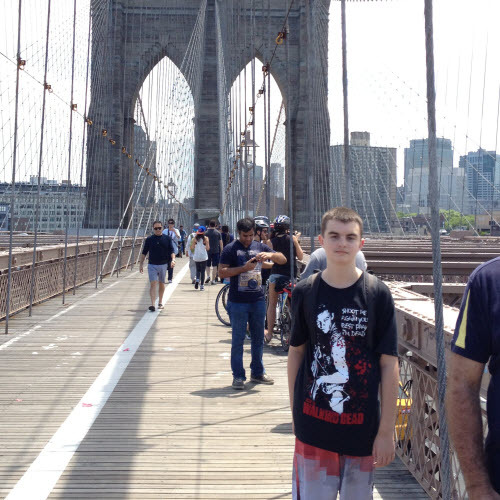 It includes the name of the student in the caption and you could identify the student from the photo. Anyone could easily find this image in Google Images, due to the file name john_smith.jpg, if the blog was set to ‘Allow search engines to index this site’. Having fun on our school camp! Word the photo like the example above so it doesn’t include the student’s name. Remember to not include the student’s first and last name in the file name. Your individual privacy guidelines also need to apply to anyone leaving comments on the blog. If a family member is writing a comment, they should identify themselves as “_____’s mom” or “______’s dad”, instead of using their name and they shouldn’t refer to name of the student in the photo. Ensure you make this part of your blogging guidelines and explain the guidelines to students and families. It’s a good idea to moderate comments and edit them if a commenter inadvertently includes names or other personal information. Then privately remind the commenter of the guidelines so they know for the future. Many classes enjoy making videos and sharing them on their blog. This quick tip from Tony Vincent demonstrates how to use the inbuilt tool in YouTube to blur faces when necessary. 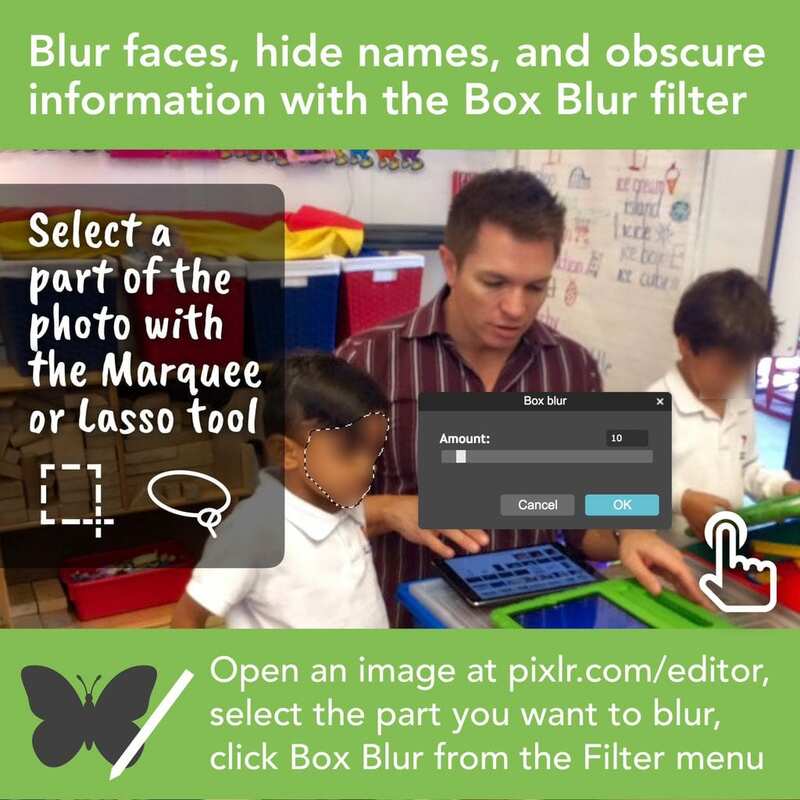 Tony Vincent has also shared this visual which demonstrates how to blur faces or sensitive information using an online tool called Pixlr. Note: This tool will require you to allow Flash but there are many similar tools available. Tell us your favorite way to edit photos in a comment! Some teachers like Keith McCray find it handy to add emojis over student faces before sharing publicly on social media. Is this something you’ve tried? There are many free apps and online tools to add emojis to your photos. If you’d like to learn more about the topic of protecting students’ data and privacy, check out the resources on Common Sense Education. This summary reinforces our key recommendations. Feel free to download a copy, display it on your blog, or share it on social media. What advice would you give? What resources do you use with students to teach students about internet safety and privacy? I totally agree with your ideas about protecting students’ privacy. I think it’s more professional to not have students’ faces in a teacher’s blog post. If there are student faces there, they should have signed a waiver. Even better, just pay for photos, or get people you know to pose for pictures. Sometimes you don’t know what will happen years later with a student. Also, thanks for all the tech tips and links to show how to blur faces both in images and in YouTube. That’s awesome. I appreciate it. Thanks for sharing your thoughts. This is certainly a conversation worth having and perhaps something some teachers haven’t put too much thought into. I’m glad the tech tips helped too! I think it is totaly fine as long as the student or parent consent.